Critical international theory encompasses several distinct, radical approaches that focus on identity, difference, hegemonic power, and order. In recent years, a growing number of International Relations (IR) scholars and students have drawn on critical theory to shed new light on global transformation(s). This book provides the first detailed account for students of the origins of critical theory and explains how it has developed and influenced IR and the difficulties of applying critical theory to international politics. Written to make these complex ideas accessible for advanced undergraduates and graduates, Critical Theory and International Politics: outlines the origins of critical theory in Marx and post-Marxist thinkers such as Lukacs and in the radical critiques of Freud and Nietzsche details the development of the Frankfurt School and the influential work of Adorno, Benjamin and Marcuse explains how Habermas, Gramsci and Foucault came to have a lasting impact on international relations delineates the recent work of critical IR scholars such as Robert W. Cox, Rob Walker, James Der Derian, Christine Sylvester, Richard Ashley and Andrew Linklater draws on past and present critical theory to formulate three interrelated perspectives on complementarity in international politics. Critical theory has emerged as a major new school of international relations theory over the past decade and this textbook is the ideal guide for all students of international politics. Steven C. Roach is Assistant Professor of International Politics at the University of South Florida. 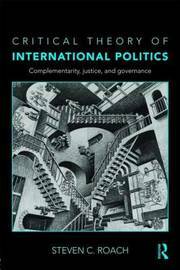 Among his books are Governance, Order, and the International Criminal Court (2009), Critical Theory and International Relations: A Reader (2008), International Relations: The Key Concepts (2008) and Politicizing the International Criminal Court (2006).